In this post I examine and define instructional design, and share why it’s essential to the development of online courses. Developing an online course that is engaging, promotes interaction, motivates learners, and above all facilitates learning is easier said than done. It’s even more challenging when trying to modify a face-to-face course for the online format. I know because I worked at a four-year college as lead curriculum designer where my job was to collaborate with faculty to transition their face-to-face courses to a 100% online course. During the process of converting more than fifteen courses I became even more appreciative of the principles and process of instructional design. I have over twelve years experience as an instructional designer, which includes creating management development courses and employee training programs. I’ve also developed courses for K-12, including math enrichment curriculum and education programs for parents. I almost always adhere to instructional design principles and a framework for all course design projects, though I’ve found online courses to be the most dependent on sound design principles. In 100% online classes, not only is one building a course, but also a virtual classroom and community. In this first post of a four-part series my aim is to provide an overview of what instructional design is and why it’s essential to the development of online education. In subsequent posts I’ll cover learning theories and their role in course design, models of instructional design, and I’ll present my own framework for online course design. Instructional Design is defined as “a systematic process that is employed to develop education and training programs in a consistent and reliable fashion” (Reiser & Dempsey, 2007). In addition, Instructional Design models or theories may be thought of as frameworks for developing modules or lessons that 1) increase and/or enhance the possibility of learning and 2) encourage the engagement of learners so that they learn faster and gain deeper levels of understanding (www.nwlink.com). Some critics of instructional design suggest that with abundance information available on the web, anyone can learn just about anything on their own terms and customize learning to their own needs. Instructional design is not at all relevant many argue—the models are inflexible and outdated. I disagree. Even though we have access to unlimited content and can learn just about anything on the web, I suggest that this is all the more reason that structure is needed to guide the learner, frame the experience, even for students seeking a self-directed learning program. I. Analyze: Integral to the design process is analyzing the learners, learning contexts and the purpose for the instruction. Though this step is often overlooked, this phase shapes the course. Included in the learner analysis is examining students’ skill level [technical and education], cultural background, attitudes and motivations for learning. Another consideration—how will students access content and instruction, e.g. what platform will be used [learning context]. Finally instructional analysis includes identifying the learning objectives [institution established or student created] and the purpose of the instruction e.g. credit, certificate or personal interest, etc. II. Develop/Select: This phase is the most time intensive. Goals for the course are identified and articulated. Goals may be specific or general depending upon results from the analysis. This phase includes identifying and selecting content sources on the web and/or developing new content, as well as developing an instructional strategy. The instructional strategy includes: selecting delivery methods or platforms for instruction/interaction, developing/selecting instructional materials/content, selecting the applications and methods to support group interaction, selecting or developing tools or methods for student assessments and course evaluation. A critical activity in this phase is developing thorough and detailed instructions for students, ensuring the delivery platform is user-friendly and that content and information is presented in a logical and intuitive format. III. Implement: This phase is about putting course into practice with students. Garnering feedback from students is critical to revising and updating the initial design of the course. Conducting formative and summative evaluation is necessary to modify the course interface, materials, content and/or instruction, to better meet the needs of learners. Though revisions and updating to online courses is an ongoing process, as learning and teaching are dynamic, always changing and evolving. In traditional education settings, classroom walls act as boundaries for instruction and learning. But online education has no walls and uses a delivery method that shifts the course development process entirely. This shift suggests instructional design principles and models are critical, are needed to address the complexities inherent to the web as a delivery mode. Following instructional design principles for online courses ensures the focus is on student learning and not on the technology or platform. In my next post I’ll review instructional design models, and examine the merits of each in the context of online course development. 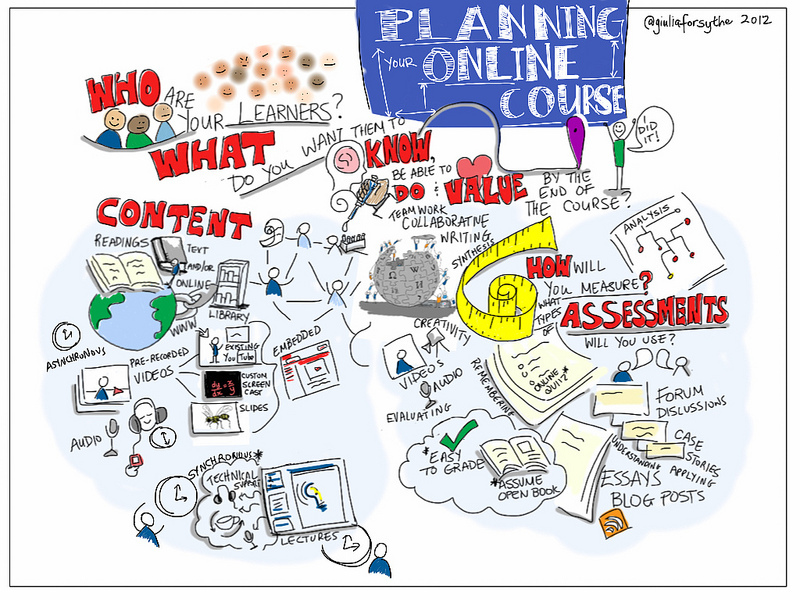 Update: Post two in this series, How Course Design Puts the Focus on Learning Not Teaching. Reiser, R. A. & Dempsey, J. V. (2007). Trends and Issues in Instructional Design (2nd ed.). Upper Saddle River, NJ: Pearson Education, Inc.
Las estrategias de diseño instruccional son necesarias a fin de no perder de vista el principal objetivo que es lograr el aprendizaje de los alumnos guiados por expertos en la materia sin oermitir que tanta tecnologpia nos invada por so es que hay que seguir los principios básicos que aquí se describen. Do you think getting into the Instructional Design field warrants a qualifying academic degree? Will experience in the field be enough qualification? I feel that having an instructional design plan, and following it, helps everyone involved. It benefits the instructors because they have a clear idea of who their students are, and how they differ from the student base in a traditional classroom. Thrasymachus mentioned that they are often older and are working. They want an online course so that they can work with time/space constraints that inhibit them from taking a traditional class. What I would like to add is that both the instructor and student need to have clear guidelines and expectations. In the analysis phase I try to survey the lecturers and the potential student base. I try to get an understanding of their learning objectives on the one hand, and their experience with the technical aspects of an online course on the other. This helps me design the training, and include the necessary background information. How right you are about having a design plan, which helps everyone involved. Even more so in online learning when there is often a team of people that are part of the development process. In some cases with MOOCs for instance, there is quite a large team, which makes having a design strategy, and a communication strategy essential. When you get to the topics of virtual classroom and community I would love to hear your feedback on StudyRoom (www.getstudyroom.com). We are not instructural designers but we built StudyRoom with the idea that online classes can actually be social and peer-to-peer learning can actually happen online. Students that take my online government coureses tend to be older, working, more mature students who have some issue with showing up to class (lack of transportation or lack of time…ie. working full time). Without question, instructors must take these details into consideration when designing their course in a way that does not betray their discipline or the rigor of a college level course. You’re right…plan, plan plan is the key! Absolutely right. Rigor does not have to be compromised for online courses – well-designed courses can offer rigor and at the same time set students up for success. Thanks for commenting and reading! Analysis is the first and most critical step to the Instructional Design process but is often overlooked. Analysis can be especially challenging for online courses where you don’t have contact with your actual learners. I will be looking forward to your future articles on this subject! Yes analysis when you don’t have contact with your learners can be challenging, but there are ways to still accomplish the essential step. Stay tuned! Thanks for commenting and reading!